See the complete Tulip Festival schedule including Brulé’s appearances. Paul LaRoche grew up as a mainstream kid in southwest Minnesota, a Native American adopted at birth by non-Native parents. Though he studied accordion as a youngster, he had little interest in music until age eight when he heard The Beatles’ song “I Want to Hold Your Hand.” He switched to piano, got serious about his music, and by age 14 was performing with a rock band that played throughout Minnesota and Iowa. He released his first solo LP in 1975 and spent the ’70s and ’80s pursuing several musical ventures while raising his family with wife Kathy. After 15 bands in 20 years, he took a leave of absence in 1989. Four years later, he lost both his adoptive parents, but soon found the one thing he’d been missing all his life: knowledge of his Lakota heritage. He was reunited Thanksgiving Day 1993 with a brother and sister and other biological family members he never knew he had. Following Kathy’s intuition, they packed up their family and left their comfortable Minneapolis home to return to LaRoche’s real home – the Lower Brulé Sioux Indian Reservation in central South Dakota. Encouraged by his family and Kathy, LaRoche re-entered the music industry as Brulé, using his music to bridge the gap between cultures. In 1999, he was selected as a musical ambassador and speaker for the U.N. Peace Conference held in the Hague Center for Peace, Netherlands, has received numerous awards including the “Outstanding Musical Achievement Award” by the First Americans in the Arts and “Best Instrumental Recording” from Star People. Weekender writer Jody Ewing caught up with LaRoche to ask about Brulé’s unique blend of music, how he turned his powerful feelings into humanitarian causes and how it all has changed his life. As a role model, how does one go about bridging cultural gaps with his or her music, and how difficult is it to accomplish? I have a love and I have a pride for both sides. I certainly love my family that raised me, and I also have a love and a pride for my Native American culture and my new family. In my heart I feel like I’ve always been connected there. But, I am a product, I guess you would say, of two cultures, because of the way my life has gone. And rather than choose sides, I’ve tried to claim ownership of both. And really, it’s been my desire to want to bring those two worlds, or those two families, those two communities, a little closer together. It’s a difficult process, but I tried to express this love for both cultures musically because it’s the only art form I had to work with. And so the music, I guess, became a product as well of these two cultures. I hope it carries that sentiment of combining those two worlds together, and I hope that it combines them in a way that is kind of harmonious. The message that I have tried to communicate is one of reconciliation and trying to forgive and heal some of the differences of the past, because in many ways, I feel like within one person, I kind of represent both sides. Your music blends contemporary Native American music with traditional Native rhythms and dance, yet the sound is uniquely your own. How do you accomplish this distinction? We honestly never set out to try to come up with something different. It just happened. And it kind of happened through a series of what I call “life events.” Music seems to follow your life, or a better way to put it is your “art form” seems to follow your life. In this case it’s music, and we’ve had such an incredible journey over these past 10 years that the music has taken on all the twists and turns of our lives, and it’s ended up being something I guess I can kind of safely say at this point – you know, 10 years later, looking back at this – that it has ended up being something kind of unusual, quite unique really, in the world of music. What types of songs or styles intrigue you most? When you talk about musical styles, I’d have to say I have borrowed from really many different types of musical styles. I love blues, jazz, classical, rock and roll. I like a lot of different “kinds” of music, but what I’ve tried to do is blend those different musical styles with some of the sounds and some of the emotion and spirit from the Native culture, so that there’s a blending process that has taken place. Blues have always been popular and that’s been a blending of sounds from yet another culture. The Latin music explosion has been huge; a lot of people like that snappy beat, but they’re blending with good dance beats and they’re made to sound like hit songs. We’ve tried to bring the Native America sound into America and into mainstream America in a way that you and I can digest musically, because it’s blended with sounds we grew up with. Tell me little bit about Brulés journey … how you got from there to here. I’ve been at this for so long, that I really do appreciate all the little things that I would say, maybe 20 years ago, I would have taken for granted. It’s been a humbling business, and it’s a humbling journey. We’ve worked very hard over the years. I would say in the past two or three years, from our perspective, it seems like the help we received along the way really started to multiply. Even these past couple of years, the well-known movie actor, Kevin Costner, has helped us out. He’s invited us out to perform in Hollywood for one of his movie premieres, which was a very exciting thing for us to be a part of that, and he invited us to perform at his wedding. Things like that have really taken the group to places we never thought, and we’ve just been very lucky. We still all consider ourselves just a little group from South Dakota that’s just been very lucky. But we certainly have worked hard. We keep a performance schedule that’s very aggressive. We’ll easily perform 100 to 150 performances over the course of a year, so we’re very busy. And we travel continuously between those stops, and we try to record at least one CD every year and this year we’re trying to record three, along with a visual DVD later this year. How has Brulé, and its members and CDs, transformed over the years? 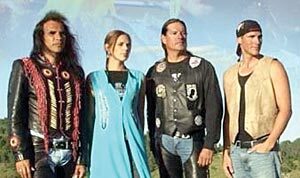 When we started out ten years ago, just the record company and myself, we came up with the name Brulé and used it because it was my tribal affiliation, Brulé Sioux. From year to year, we added members, went through different people, and as each new member came in we never changed our name. Then five years into this, my son Shane and daughter Nicole started to join the band. When that happened, we found there was an audience that particularly enjoyed Nicole’s flute primarily as the lead instrument. So I kind of had the idea to do a series of recordings that featured that flute sound, but still had the Brulé band behind it. Now we’re starting a series where my son Shane is producing the music and has got more of the guitar sound to it, and that’s a lot of where the Tatanka project and some of the newer things are starting to come from. As my son is getting involved, we’ve started this new series that is now labeled under the acronym AIRO. We’ve kind of labeled these so people can identify them as either having more of a flute sound or more of a contemporary sound, but really, they all feature Brulé and they all have the Brulé band as the main ingredient. You often credit Kathy – the group’s artistic and business manager – as the stabilizing force behind Brulé’s success. She’s got to have the credit. I would not be here without her support or belief. We’ve been married for 30 years, which I think we’ve kind of beat the odds there, too. Not just being married 30 years, but Kathy’s been married to a musician for 30 years and that’s a trying journey there. And she’s done well at it. She’s allowed me to follow my dreams and she’s done it with class and with a good heart. Not only that, she is responsible for our family being on this unusual journey. Because of her efforts and because of her gut instinct, her intuition, she’s made this whole thing happen. She’s a special lady. I feel like one of the luckiest people in the world. Because here I am, I’m 50 years old, and most people who are 50 who are still trying to be in the world of entertainment are washed up. They’re either retired or maybe trying to go out and do the oldie circuit. They certainly aren’t in the middle of their career. And I maybe feel like that’s where I’m at. I’m able to travel with my family. I’m able to work with my kids, my wife, and even our granddaughter travels with us whenever she can. I’ve been blessed I guess you could say. And then as an added bonus, even above that, I get to tell this story about what happened to us and I think it makes people feel good and it seems to touch them in a way that has an effect on them. So when you add that all up, I’m able to do something that is rewarding, I’m able to do something that has a positive message and I’m able to be part of something that I truly love in my heart. So that’s what makes my heart sing, and I couldn’t be luckier. I’m one of the luckiest people in the world. Barry, thanks so much for your insightful comment! This group is truly making a difference. And, thank “you” for your service!